What do Adolf Hitler, HG Wells, Leonardo da Vinci, Genghis Khan and dinosaurs have in common? They all find themselves in a rather precarious situation in this hoot of a book from the masterful Martin Chatterton. Mortimer DeVere and his sister Agnetha are 10,000 years old. Residents of Unk Island, the duo are tasked with some serious fast-forward living, not to mention the coolest capability of returning to the past in Retro, their time-travelling machine. 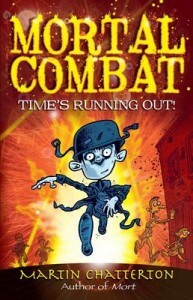 In this sequel to Mort, our young heroes find themselves stranded in the midst of World War II, along with Trish Molyneux and her assistant Nigel from the Unk Shire Education Department (who are both intent on dragging Mort and his sister back into the schooling system). Confronted by machine-gun wielding Nazis, the team are aghast to find themselves facing a divinely camped-up version of Adolph Hitler. When Hitler insists on taking a ride in Retro, no one could have predicted the time-machine would end up in dino territory – let alone the most gruesome fate that unfolds for the notorious Nazi leader. Let’s just say the dinosaurs are hungry! But what does this mean for the linear properties of time? Kids will delight in the chaos that ensues from Mort’s ‘messing with the past’. I love the clever combination of fiction and history Martin Chatterton uses in this hilarious series of books for kids aged 8 – 12. The author uses a fine balance of action that would suit both girl and boy readers (naturally, Agnetha is the smart, rational one who ends up saving the day) and I simply adore his ‘voice’ and witty use of dialogue and kooky settings. The author’s fabulous ink drawings add priceless visuals to the storyline, and only add to the dry humour. Mortal Combat: Time’s Running Out is published by Random House. Surrealistic comedy adventures. One thing most of the best ones have in common is that they don’t patronise children. I’ve always believed in reading (and writing) ‘up’. If there’s something a reader doesn’t understand then that’s okay. I avoid whimsy, fantasy and ‘issue-based’ fiction like the plague. Also anything with cats. Apart from the The Cat in the Hat. I don’t read any children’s books now so all my choices would be books I read as a child. I LOVED Dr Seuss and still do. Apart from comics (which I lived for), I devoured adventure books like The Famous Five and Secret Seven by Enid Blyton and the Biggles books by Capt WE Johns, without ever thinking they were ‘great books’. The first works that I thought were both enjoyable and genius were the Molesworth books by Geoffrey Willans and illustrated by Ronald Searle. Funny, original and fresh, they tell the story of Nigel Molesworth and his various schemes at St Custards. Wonderful. I loved the Just William books by Richmal Crompton, the Professor Branestawm series by Norman Hunter. I loved these books and they were a big influence, as was The Phantom Tollbooth by Norton Juster (which I had the pleasure of illustrating a cover for a Harper Collins edition). The Alice books I also loved (and still do). I suppose my taste ran to absurd comedy and adventure which is pretty much what my children’s stuff is now, Mort being a prime example. Number one: It must be a page turner. As a child – and now – I have no patience with books that feel like eating muesli without milk. I don’t care about the angst, just give me smugglers and pirates and monsters and comedy and danger and cliff-hanger endings and miraculous escapes and weird powers. An example of a perfect page turner might be something like the Stormbreaker books by Antony Horowitz or Eoin Colfer’s Artemis Fowl‘ stuff (I lied about never reading children’s books). I felt that Harry Potter should have been like this but, for me anyway, wasn’t. Number two: Someone should die. All my favourite children’s writers killed characters off (often, as with Roald Dahl, before the narrative begins). Children need to find out early that life can be tough (even if they only read about it). If no-one dies, then bad things should be allowed to happen. If there’s no believable danger, there’s no thrill. Number three: It shouldn’t be a picture book. This is a very selfish one. I know there are lots of great picture books. It’s just that I (and bear in mind I’m an illustrator) always feel that picture books are for the parents. Other than Dr Seuss, I think all picture books are really aimed at parents not children. Even Where The Wild Things Are, which is probably loved by millions is really for the adults. My kids enjoyed some great picture books as youngsters but the books they loved were ones they chose, or found. A case in point is Shaun Tan. As an artist I love his work. I’m not sure I’d find a single child who would enjoy his stuff. But I’m bitter so maybe my opinion doesn’t count. Don’t make them read boring books. My brother was forced to read Northanger Abbey at school at the age of (I think) about 11. He never recovered. I’m assuming these would be children’s books? If so then they’d be: Harry Potter, for obvious reasons (although mine would have been better). For anyone who has been living on Mars, that’s by JK Rowling. Alice’s Adventures In Wonderland by Lewis Carroll. Lastly, it would probably be Horton Hears a Who by Dr Seuss. After time spent as Creative Director with the London design company he co-founded, Martin moved between the US and UK for five years before eventually emigrating to Australia where he has been based since 2004. In addition to his books for children, Random House will be publishing his debut crime fiction novel in 2012. He lives in Lennox Head in northern NSW and is married with two teenage children. Stay tuned for my review of Mortal Combat: Time’s Running Out.